There’s been a lot in the news lately about water shortages in the West. In the search for any help they can get, some concerned citizens are turning to the oft-maligned beaver. Living on Earth‘s Steve Curwood gets to the bottom of the story with Sarah Koenigsberg, the filmmaker behind The Beaver Believers. “Koenigsberg: What they do is they redistribute the water that does fall down onto the landscape, so if you picture spring floods — all that water that comes rushing down in March or April just goes straight through the channels and out to the ocean — what beavers do is they almost act like another snowpack reserve, whether it’s rain or snow runoff, all of that water can slow way down behind a beaver pond and then it slowly starts to sink into the ground. It stretches outward making a big recharge of the aquifer and then that water ever so slowly seeps back into the stream throughout the rest of the spring and summer as it’s needed so that we end up with water in our stream systems in July and August when there is no longer rainfall in much of the west.” More here. 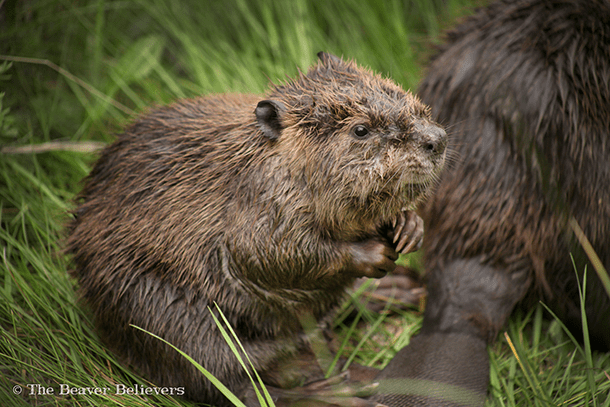 The Beaver Believers live-trapped a beaver family including this kit in Aurora, CO, and relocated them into the forest on a private ranch. I knew someone nearby who was at war with beavers … until she wasn’t. Their dam initially killed off many tall grasses, and she said it smelled horrible. But when the beavers were done, there was a lovely little pond. That’s so cool! Thanks for sharing! We are using our property on Deer Creek in Utah as a re-introdduction site for beavers. They have already changed a deeply eroded creek channel iinto a verdant meadow filled with ponds and willows. There is more wildlife too.The change is transformative. All in a very few years. Beavers are amazing critters! It’s awesome to hear testimony from someone who is actually doing it! Thanks, Caroline.